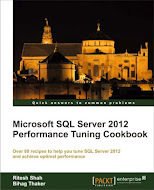 This is fifth part of the series of Integrated Full Text Search in Microsoft SQL Server 2008. If you want to study the topic in depth, Please read my past four articles in this series. Below are the links of the same. We have already looked at FREETEXT and FREETEXTTABLE predicate in iFTS using Microsoft SQL Server 2008. Now, this is time to look at one more interesting predicate “CONTAINS” in iFTS. CONTAINS is a more advanced version of FREETEXT predicate. It can accept column(s), search condition like FREETEXT and search simple words, other than that, it can search close words to the word specified into search criteria, thesaurus, synonyms, inflectional words. CONTAINS predicate don’t automatically search inflectional words but you have to use FORMSOF clause with it. Let us see some practical example to make concept clearer. Note: I am using the same table & data which I have created in my past articles. So if you are directly landed to this article, kindly get the create table script from second article. –NOTE: we have Volatiles as a plural and in our data, it is singular. CONTAINS is really lot more powerful than FREETEXT search. Isn’t it? This entry was posted in Uncategorized and tagged Contains, formsof, iFTS, inflectional, Microsoft, MS SQL Server, NEAR in CONTAINS, Ritesh Shah on October 21, 2009 by Riteshshah.